Morrisville, PA is a scenic Bucks County hamlet on the Delaware River opposite Trenton, NJ, with plenty of shopping, recreation and tourist sites nearby. 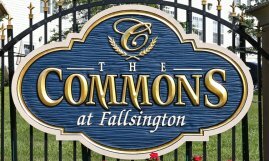 Your apartment or townhome at The Commons at Fallsington is a great base to explore the area; plenty of transit links put you within reach of Philly, New York and beyond. The international chemical manufacturer is based down the road in Bristol, PA. The defense contracting giant builds satellites and other space systems in Newtown, PA, just 20 minutes from Morrisville. Trenton’s Hutchinson Industries manufactures specialty tires for military, police and off-road vehicles. Their products are used worldwide. The number of local employers located near The Commons at Fallsington Apartments is just another reason why it's great to rent your apartment in Morrisville, PA.